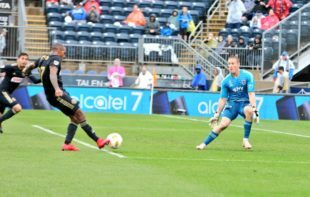 Jay Simpson scored twice Sunday as a Philadelphia Union squad featuring mostly reserves defeated Western Conference leaders Sporting Kansas City 2-0. Jim Curtin rested most of the first team starters in front of Wednesday’s U.S. Open Cup Final in Houston. Auston Trusty started next to Mark McKenzie, and Olivier Mbaizo was given his MLS debut at right back. Derrick Jones and Warren Creavalle sat behind Borek Dockal in the midfield. Jay Simpson was given the start up top, with David Accam and Fabian Herbers on the wings. Philadelphia started well and had a series of chances in the opening 10 minutes. First Jay Simpson skipped a shot wide, followed by David Accam weaving through the Sporting backline only to fire high over goal. The best chance came in the 9th minute when Accam skidded a cross into the box that Simpson got a foot to, but Melia was out quickly to smother the opportunity. Kansas City should have opened the scoring in the 28th minute. Gerso Fernandes got behind the Union backline down the K.C. right side, pushed the ball past an advancing McCarthy, but could only fire into the side netting from the tough angle. The Union found themselves unlucky not to be in the lead after a crazy sequence in the 36th minute. Kansas City only half cleared a Union corner kick and the ball fell to Herbers at the top of the box. The midfielder drove his strike into the ground, and the ball deflected past Melia onto the crossbar before coming back off and hitting Melia’s foot again. Jay Simpson was the first to the ball, but his shot was denied by Seth Sinovic on the line, and the ball was finally cleared. Philadelphia had a good shout for a penalty in the 42nd minute. Jay Simpson backheeled a terrific pass into the path of Olivier Mbazio. The right back showed some fancy footwork as he took on Matt Besler and pushed the ball past him, but Besler got his hands up high to deny Mbazio a path past him. Mbazio went down, but referee Mark Geiger was unmoved to make a call. Alejandro Bedoya replaced Borek Dockal in the 55th minute. Dockal looked healthy and lively throughout the match, and he should be close to 100 percent for Wednesday’s big match. Philadelphia took the lead in the 71st minute through Simpson. Auston Trusty played a deep ball into the box that Alejandro Bedoya rose highest for and headed inside for Simpson. The striker took the chance first time, striking a low volley into the far post from 13 yards. The Union doubled their lead as Simpson grabbed a second in the 89th minute. Fafa Picault advanced the ball down the Union right and lofted a cross into the box as Bedoya made a perfectly timed run behind the KC backline. Bedoya cushioned a header down for Simpson, who took a touch and then finished inside the near post past Melia. The Union kept pace in the Eastern Conference with the win and remained in 5th place, just a point behind Columbus (who they play next Saturday) and just four points behind New York City FC. If nothing else, we can now say the Union have quality depth. Good to see some nice saves by McCarthy on a wet day. Fivethirtyeight.com now has the Union at >99% to make the playoffs. Definite shout out to McCarthy. Solid game with some sweet saves. Where’s the Geiger counter? How can a player shouldering another player in the chest and making no attempt to play the ball NOT be a penalty? Please explain. This is directed at anyone not specifically at you Osager. I’m just can’t believe the non call. Geiger Counter will be there for the Player Ratings. I’m sure there will be note of the PK. Six points from Away to Seattle and Home to Sporting KC? Incidentally, the OPTA report on the MLS website says there were 15,000 plus in attendance and that the weather was clear. That Jay Simpson… he sure stinks. In other news… whoa crowd. I fully admit that Simpson is not as bad as I thought. He’s obviously misplaced in this Union team and has been hurt by that fact. Kudos to him and thanks for the win. Bad on the Union front office on signing a player who is as Curtin described himself, “…more of a second striker”. Wow! The reserve squad did themselves proud today! John McCartney was doing his best Andre Blake. Great tailgate! Great result. Great momentum heading into Wednesday!! Was at the game today. First I’ve had the chance to get to live. Remarkably, I’ve been in the stands for every union goal scored by Jay Simpson. Was a nice win. He looked good a lot. Always threatening. Has a sharpness and pace I don’t think Sapong has. Might be quicker than Burke, too, but it’s close. Someone will have to explain to me how Besler’s ridiculous foul of Mbaizo wasnt called. There was nothing subtle about it at all. The linesman closest had a clear view as well. It was truly shocking. How and what is VAR if not for that sort of situation? If Philly hadn’t won, it would be a scandal. I totally agree on the foul Pete (see above). The cynical part of me wants to say ESPN Sunday game of the week with Western conference leader, previous MLS cup winner, previous US Open Cup winner, MLS darling coach who rumored for USMNT coaching job VS. Jim Curtin and the 5th place Union, losers of two US Open Cup finals, one of which was to said KC team. Oh yeah and add in Mark Geiger. But that’s only if I was being cynical and uninformed. It also occurred to me that he would never earn such a call in his very first start. Besler, by contrast, will always get the benefit of the doubt over a rookie like Mbaizo. … or “McBaizo,” as it appears so beautifully mistyped! “Not retreating” is not reason for a caution. I didn’t see the match, but I assume the card was given for “Delaying the restart.” There are seven reasons for cautions and seven for send-offs in the Laws of the Game. It’s best to use only these. “Not retreating” is what is listed in the box score on MLS.com so I think Mike is well within his rights to use the term. Like Andy said, just going off what is listed in the box score. Not sure I’ve ever seen it as “not retreating” but that’s what MLS says, so that’s what I wrote. I believe that the card was for dissent. He was a bit peeved at the time. Not retreating to me translates as I told him to get out of my face and he didnt. It actually looked like he kicked out at the ball and deflected it immediately after it was kicked while he was still within about a yard of the player taking the kick. “I don’t want to go watch a Union B-team lose in the rain,” said my partner. I foolishly agreed and sat at home watching. Of course they win! Cannot wait for Wednesday! Fun game. Glad Simpson made his mark thanks to Bedoya. Hope not too late apropos his contract. Tip of hat to McCarthy. I am not a fan of him being second keeper but he was very good today. Reason I find hard to cheer for him is knowing his concussion history I cringe when he plays and late in game I had that sinking feeling. Glad he is ok and did so well. Was out so caught this late in first half, but wife and I did watch whole Seattle game–worth the fatigue at work next day. Note both days they had less than 40% possession but were aggressive theoughout. Not Curtin’s normal style especially this year. In that light maybe there was more behind the scenes handcuffing Curtin. Talent has been there all along. Or just coincidence they hired Adam? Good job guys, very well done. Or maybe take it for face value that Jim is a good coach who has done a great job with extremely limited resources and talent? Amazing. Franchise record for wins, 3 OC finals in 5 yrs, possibility of a home playoff game, just shut out the best 2 teams in the West, literally the best Union season ever. And the coach still gets booed and crapped on. Not 1 word of positivity on here. Truly amazing. Per Doyle: Philly in all games since mid May: 16-7-2 (2.0 ppg). 42 gs to 32 ga. That’s elite. Full marks to Jay Simpson for the goals. Even fuller marks to him for how he played the # 9. There were subtle redirections of one touch to players breaking distributed both back and forward that the other #9s do not do. and he adapted to how Besler and Opara were both playing him. You cannot play him for speed into the green space behind a back line. but two [oised clinical finishes. A bigger story is that our front-line reserves took down a top team in the west. They had injuries at striker. Nemeth is no slouch, but is not their first choice. But otherwise that was their a lineup I think. There is no other way to say it. Our heavily rotated side beat their best available on the the day. Luck helped a great deal. They missed several open looks. But even so. WE saw the benefit of the rigid template today. Heavy rotation did not badly disrupt the club’s pattern of play. They knew how to play together with a certainty and confidence that cannot be created in in a day or two. It is only one game. But it made a statement about the quality of the side side and the quality of what the organization I creating. In some ways that win is Earnie Stewart’s legacy. Sorry — obviously I meant the top team in the West. Also, el P, was that supposed to be my peyote trip? Second paragraph: “McBaizo” – The thought of M’Baizo being secretly Irish just gives me a giggle. What an amazing win for this team leading into the Open Cup Final. Typo corrected?! “McBaizo” needs to be sold in the Union store ASAP! Haha. I don’t know why I typed that a few times when I was writing. Having talked to him after the match, I can confirm he is definitely not Irish though. Thanks y’all! Not a frequent commenter but love the work you do. We’ve gone from a team that couldn’t get three points from its first 11 in big matches, to a team that can take 3 points from a top team with pretty much a reserve side. That’s progress. Live with it, we are getting another season of Curtin. Deservedly so. I wanted him gone at the beginning of the year, but Stewart’s patience/vision won the day. This team isn’t punching above their weight, they are actually good.